Please to be enjoying yet another exciting aerial photo of Reston, this one from the end of the shag-and-disco era that was the 1970s (much larger version here). Looking east from a vantage point above Sunset Hills Drive (running from top to bottom), you can see that Reston's brownish garden apartments were by 1979 brushing up against what was left of the 'ole distillery's operations, which in turn backed up against new townhouses and behind them, the golf course and the older townhouses on Golf View Court and Links Drive near the top left of the photo. 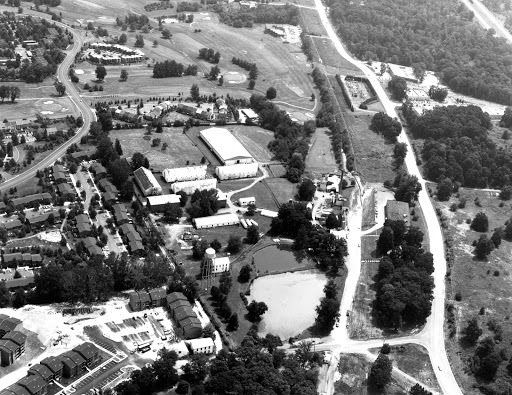 (Check out the barns, water towers, and even a distinctly non-Reston-like smokestack roughly where the one-time Fannie Mae building now stands, plus what appears to be construction on the W&OD trail, at this point still bereft of spandex-wearing cyclists.) Reston's oldest building is sadly not visible from this vantage point, though we think it's hidden in the copse of trees near the bottom of the photo. It's a rare juxtaposition of past and present-day Reston. And we can't help but wonder: was there tension between the whiskeymakers and homemakers? Did errant golf balls wind up landing in the vats, or whatever one distills spirits in? Did the UVa marching band, hopped up on Virginia Gentleman, crash open houses in the nearby developments? Did the RA mutter under its breath about the unsightly white roofs of the distillery's buildings? We may never know, but it's still fun to think about a time when the old and the new stood side by side, and Plaza America was still virgin forest, the end. Or perhaps did errant golfers somehow wind up at the distillery when chasing their balls...and the rest was history? Love your distillation of this shag-and-disco tableau, BTW!